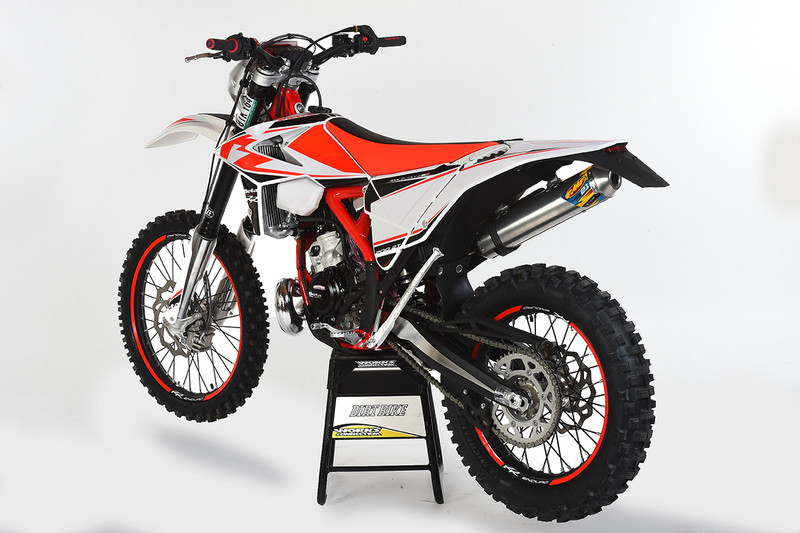 Last year, Beta came out with the first all-new two-stroke to arrive in a very long time. It was the 125RR, a bike that was more or less demanded by the European market. In general, Americans don’t get that excited about 125 off-road bikes, but we’ve been yearning for a 200 since the KTM 200XC-W went away. Europeans, on the other hand, never really warmed to the 200 concept. So the design team that built the new Beta 125 was tasked with making a 200 as well, using as much of the same design as possible. You can’t just punch out a 125 that far, so it took different cases and a new top end with a different bore and stroke. But the same layout was used with many of the same parts in the lower end. The 200 got electric start as standard equipment with an optional kickstarter, whereas it was the other way around on the 125. The motor uses a mechanical powervalve, a V-Force reed and a Keihin PWK 36mm carb. Engine lubrication is accomplished through Beta’s oil-injection system. There’s an oil tank under the seat and various safeguards to keep it from running dry. America has been wanting a 200 off-road bike for some time. The frame is directly from the 125. It isn’t a 300RR frame, and it isn’t the frame from the Xtrainer. All of those frames are very similar; they have a steel backbone, linkage rear suspension and identical aluminum swingarms. They have slight differences in seat height and ground clearance. The 200 is actually larger than the Xtrainer and smaller than the 300, if only by a very small amount. The suspension is built by Sachs. In the rear, the shock is more or less conventional with separately adjustable high and low-speed compression as well as rebound damping. The fork is a little more unusual. It has a single spring in the right side with a large preload adjuster that can be operated by hand. The 200RR handles like it weighs nothing. On the scale, the 200 is only a little more than nothing. It weighs 221 pounds without fuel. That’s about 11 pounds heavier than the 125, which has no electric start. That’s pretty amazing–remember when an electric starter added a minimum of 25 pounds to a bike? On the trail, the fact that it’s so light is awesome. You can toss it around and basically it lets you get away with anything. If you love 125s (like I do), you know the drill. The difference here is that you don’t run out of bottom end so quickly. The 200 doesn’t require constant clutch work. The oil injection system saves you money on premix oil and results in less drool and less smoke, There’s only an occasional puff from the muffler. 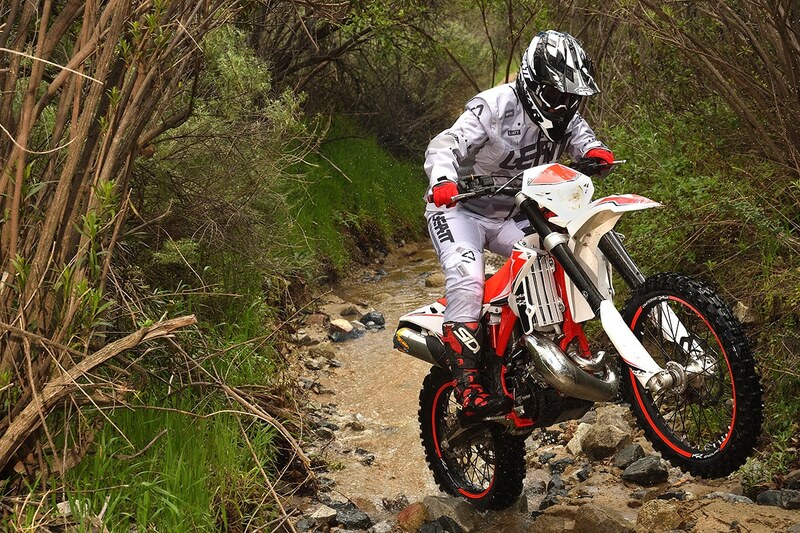 Initially, we used the bike for marking much of the 6 Hours of Glen Helen course. Since then we’ve been riding it every chance. It has plenty of peak power, too. Pete Murray, who loves riding small-bore two-strokes each year at the Two-Stroke Nationals, started scheming right away to get his hands on the bike for that weekend. 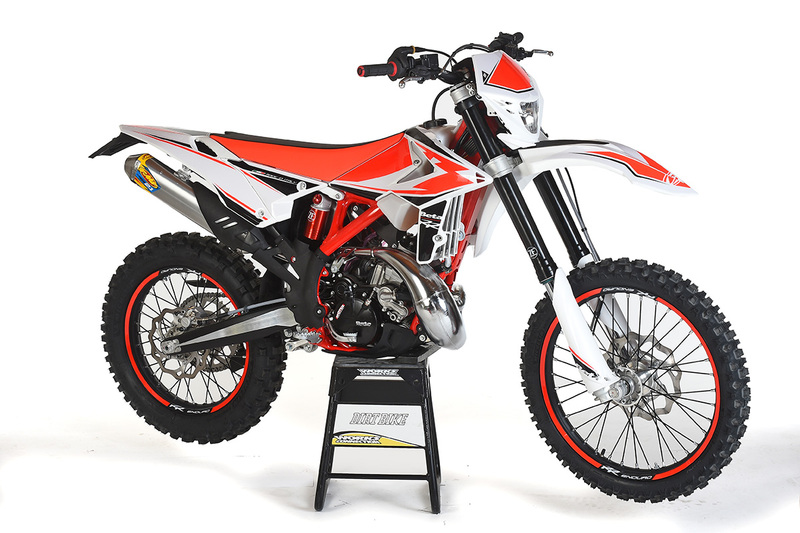 The motor would definitely be suitable for MX–it will beat any stock 125 and is much easier to ride than the ported ones. The Suspension is a bit of a mystery. Right now it’s set up for a 140 pound rider. You can crank up the preload in the right fork leg with some success, but if you’re thinking moto, it will need a stiffer spring. The Beta 200RR will sell for $8399. In fact, there’s a long line of riders who have pans for our test bike. AMA off-road director Erek Kudla will have it up at Red Mountain for this week’s District 37 Sprint Enduro. It will be interesting to hear what he has to say. 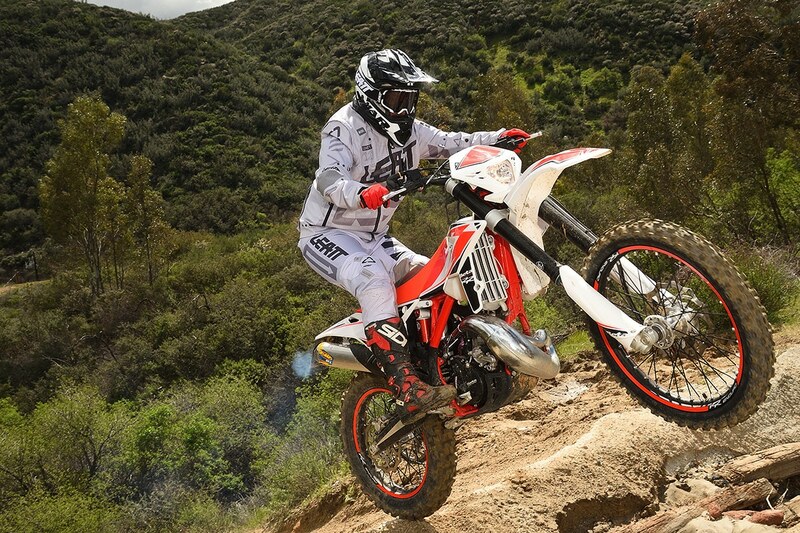 The full test will appear in the June, 2019 print edition of Dirt Bike. 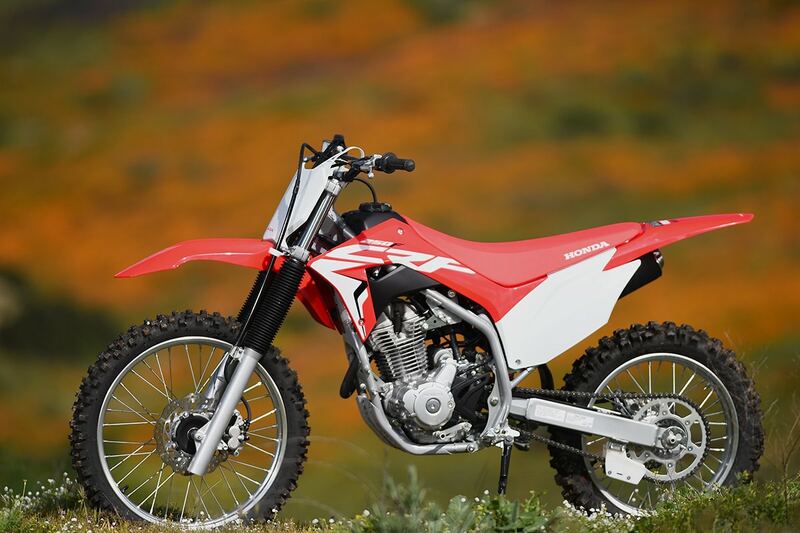 Honda hasn’t offered the CRF250X in recent years, but for 2019, there’s a brand new CRF250F off-road bike. You gotta pay attention to the suffix in the name to understand this bike. The “F” stands for Family, and that generally means that the bike is aimed at entry-level riders. 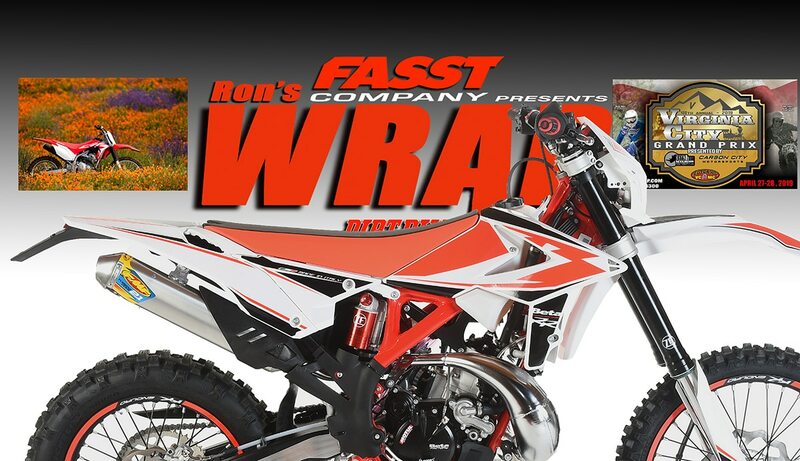 This bike, then, is a replacement for the CRF230F, and isn’t really intended for the CRF250X crowd. 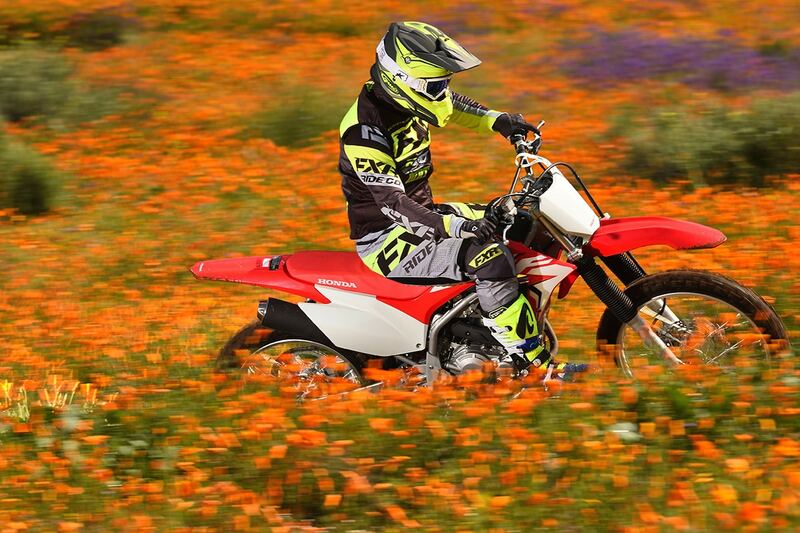 Those riders will have to wait–next year we expect a more trail oriented version of the CRF250RX that was introduced this year. It’s also a little confusing that Honda kept the 230 in the line for 2019. This was done because the 250 was going to arrive late in the year and Honda had to have that segment covered. Almost all of the F models got a redesign for 2019. There’s a possibility that a dealer will have both, but frankly, we can’t imagine why someone would still be interested in the 230. It was always a little bit of a throwback to the past. It had a drum rear brake, it was carbureted and a bit overweight. The 250 is lighter, runs better, has better brakes and looks like a bike from this era. The 250 is perfect for a teenagers and small adults who aren’t interested in racing. It has electric start and the price is reasonable. It sells for $4599. If you live in California you’re probably seen the hillsides covered in beautiful California Poppies. Record rainfall caused a superbloom, giving us a rare back drop for photo shoots in the area. You also might be aware of the poppy hysteria that has caused traffic problem and road closures. That’s fine; it won’t last long and people are enjoying the view while it’s here. Unfortunately, there’s also a undercurrent of misinformation on the subject. Yes, the Poppy is the state flower, but there are no specific laws protecting them. 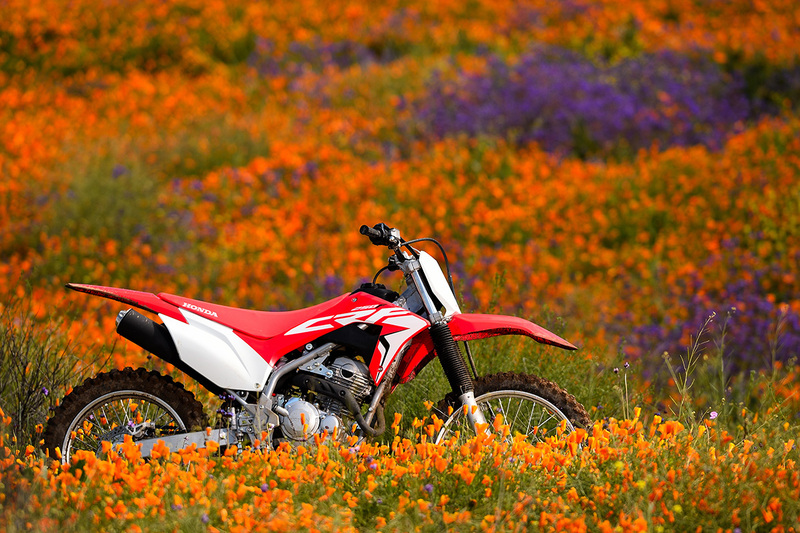 No one is going to throw you in jail for running over poppies on your favorite trail. If you are trespassing on private land or riding off the trail on state land, that’s another issue. You can read about the rules regarding the California Poppy here. NBC Sports has been doing a great job with live coverage of the 2019 AMA Supercross season. Last week was a rare exception, where the broadcast ended before the winner was announced. Everyone knew that Marvin Musquin crossed the finish line with a heel clicker, but it was unclear if he was going to be disqualified for overriding the red cross flag on lap two. In cases like that, or if you aren’t around a TV set, you can always come here. Dirtbikemagazine.com has live coverage of each Supercross with results and photos by Travis Fant posted immediately after each practice, heat and main. This week, the event is at Houston’s NRG Stadium and it will be the last Triple Crown format of the season. The 48th annual Virginia City GP is coming in about a month. It isn’t often that you get to ride through a State Historic Landmark, but that’s what the town of Virginia City is, and the start will be right there. The Dirt Bike staff will be there. One of the fun things about this year is the new Adventure bike class. There are also minis. It should be a blast! In case you are thinking about the ISDE in Portugal next fall, there is a new class structure. This will not change the classes for the U.S. Qualifier series, which is starting this week in the west. All Balls now has fuel-pump rebuild kits for most modern bikes. The price is much less than buying all the OE parts separately and everything you need is in one package. This is long overdue. They start around $69.95 and are available through allballsracing.